In the world of gaming, the sport of golf has occupied a rather unique space. There are often two main types of golf games, generally: those focused on a realistic, accurate depiction of the sport as it is played in real life, and the fanciful versions that journey into the world of magical realism. It’s a bit of an odd notion that Everybody’s Golf, one of the more recent interpretations of the sport, manages to blend accuracy with flash and style. It isn’t a flawless marriage by any means, but it is a lovely and relaxing game of golf. What’s more important is that it’s also a lot of fun as well. 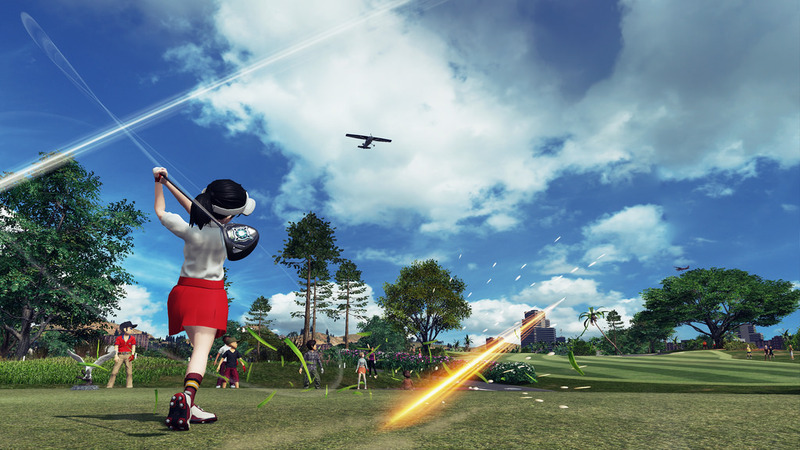 Everybody’s Golf is the newest iteration of Hot Shots Golf, only with a more wholesome and inclusionary new moniker, so if you’re familiar with and enjoy that series, you’ll feel right at home here. If you haven’t been properly introduced to that series, Everybody’s Golf is quite welcoming from the start; as soon as you hit new game, you’re prompted to create an avatar. This Mii-esque version of you will represent you in all things golf related. You can customize your physical attributes such as height and weight and there are a number of base clothing selections to choose from, although winning the various tournaments and spending coins at the shop will unlock more outfits for you to peruse. From here, you are dropped into the hub, the central point of all things golf in the game. From here, you can access the shop and the menu and the various options and types of matches (but to play local multiplayer, you need to quit out to the title screen, however). Playing solo means starting at Rank 5 (translation: Newbie) and being thrown into the shallow end of the pool with the beginner tournaments on the back nine of the Eagle City course which is a nice, easygoing course, and your opponents are very forgiving. Being the beginning courses, however, they are worth the least number of coins and experience for winning, though you’ll still unlock random items for your closet. In fact, the beginning tournaments are so easygoing, that if you just want a more casual, laid back experience, you can still compete here, even after you move up to the higher ranks. You get a standard set of clubs, to start out and a couple beginner level balls. These balls won’t run out, but any other balls you buy or earn throughout your golfing career will, so be careful. You’ll unlock new clubs as well over time and each club, individually, has several attributes themselves, such as power, control, backspin, and backdoor. Power is the stat associated with distance and affects how far your ball will travel when struck. Control affects how much sway affects your ball, or if you manage to strike your ball straight on, how much it will veer to the left or right. Backspin affects how successful your shots using the various types of backspin will be. Finally, backdoor affects “chip in” shots, or shots you manage to sink from relatively near the hole, but not on the green. When you begin the game, you will not be able to hit the ball very far or very hard. As you can see, progression in the game works on two levels, as you are ranking up your golfer to unlock new outfits, courses and tournaments, but you are also leveling up your clubs in the process as well, to increase your potential to hit more successful shots. There’s also a rather robust online component featured in the game. You can elect to do standard online play or turf war. In normal online play, you can choose to do one hole or nine or even eighteen. Leaderboards are calculated in the early mornings based on the previous day’s performances. 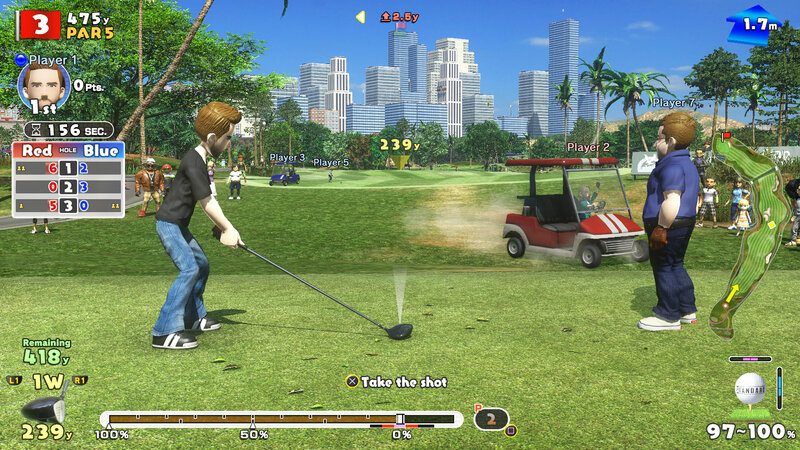 There are also several mini games available online, such as fishing or golf cart races around the various courses. While online, you (as well as other players) can roam freely around the courses and tee off wherever you see a special “tee off” area. The mechanics of the game, are easy to learn, but require practice to master the advanced maneuvers. Basically, teeing off involves a 2 or 3 button power meter and when you press the X button, the power meter will slowly rise from zero to the 100% mark. When you hit X again, where the meter stops determines the force of your swing. When you do hit X, your shot power is marked and registered but the meter will keep going and then reverse direction. When it comes back nearly to where it started, you’ll want to hit the X button again on the small silver oval shaped indicator. Waiting until you’re left or right of the indicator will affect how far left or right your shot will veer off. If you hit the button too soon or wait too long, and you hit the X button when the meter is outside the small red zone indicated on the meter, the screen will flash and you’ll hit a shot that will only go a few yards. This meter based skill mechanic is the way all shots work, from tee shots, to putting. If you’re the type that likes to simplify things, to be fair, you can get a lot of mileage out of leveling up the power attribute on your clubs and then just smashing the ball as hard as you can to send it screaming down the fairway towards the green, after all, you do want to get to the hole in the fewest number of strokes. There’s also quite a bit of useful info on screen when you’re lined up to hit the ball as well, from wind speed and direction to the lie and slope of the green and the controls for on the fly club switching, and also a button layout for the d pad + other buttons that can affect your shot in different ways. There are also a number of special shots in the game designed to help you progress through the courses and increase your overall confusion level. To add spin to the ball, you simply need to press a directional button at the moment of impact, or when your club actually smacks the ball. (You can also hold the button down.) To add top spin, you hit up on the d pad, to add backspin, you simply hit down. Hitting left or right adds side spin. Top spin typically makes the ball skip off the ground, while backspin slows things down and generally causes the ball to stop as soon as it hits the ground, instead of letting it roll for a bit, as it usually does. You can also use a move called super back spin (also known as the homing shot) by pressing up when setting power, and down upon impact. If you manage to get a perfect impact, the ball will burn with blue flames and spin backwards on the fairway, or shoot towards the hole on the green. There’s also a super top spin move (rising shot) that, conversely, uses down when setting power, and up at the moment of impact. A perfect impact here results in a low flying top spin shot that can also skip across water. There is also a super side spin (spiral shot) that is achieved by hitting right or left when setting power and then the opposite button upon impact. This shot gives an even bigger curve than a normal side spin. It isn’t mentioned in the game, but there’s also a super diagonal shot available as well. Scoring works much the same way as in traditional golf. In stroke play, you and your opponents are competing to see who can reach the hole in the fewest number of strokes. Points are also awarded per hole, based on overall play, so if the number of strokes is tied, points determines the winner of the hole. In match play, each player plays simultaneously and the winner is the one with the most points. Hitting par at a hole doesn’t affect your score, while achieving a birdie or eagle or hole in one gives you -1, -2, or -3, respectively. Some tournaments have special cups, such as mega cups, which make the holes bigger and tornado cups which pull in anything that come close to the hole. Visually, everything is bright and bursting with color and charm. The lush greens on the fairway really pop and the darker hues of the forest courses contrast nicely with the highly reflective water in and around the grounds of most of the courses. Many of the special shots and nailing a birdie or eagle or hole in one are met with impressively snazzy displays of colored light and fireworks in a mini celebration, which is always nice to see. These typically don’t last long, only a few seconds, but it’s still a lovely addition, nonetheless. The game itself, for all its charm and fun, isn’t always a hole in one, however. The biggest problem is that the math doesn’t always work out as one would expect. For example, if you have a distance of 50 yards to the hole and your maximum shot would cover 100 yards, you’d think hitting at 50% power would land you right in or next to the hole, but it doesn’t always work that way. Even taking into account variables such as wind and slope, etc, it still seems off by a bit. Now one can make a rather persuasive argument that, this isn’t a traditional golf game in the same vein as the PGA Tour series, but still. It’s a minor flaw, that has been prevalent in the Hot Shots Golf series in the past, and is all the more noticeable this time around, thanks to how wonderfully the rest of the game comes together. When you step out on the green, the fog newly risen and the sun just peeking over the horizon. When you draw back your club, golden light piercing the unbroken surface of the nearby lake, highlighting the tiny dewdrops holding onto each blade of emerald hued grass. When your ball screams through the clouds like a comet, seemingly set ablaze by the sun’s rays and drops in a perfect arc near the cup, onlookers and opponents standing in applause. There are many moments like these that make Everybody’s Golf a delight to play. It isn’t a perfect game of golf by any means, but what it is, is simple, undeniable fun. Previous Entry The Evil Within 2 is a solid sequel that surpasses the original in just about every way.